With Clean Slate, Windows Updates and antivirus updates are saved even when security is active! Fortres Grand offers free technical support without the cost of an expensive, yearly maintenance fee! Clean Slate®, nonrestrictive hard drive protection & restore technology, discards unwanted user changes at log off or reboot, no partitioning ever, effortless Windows Updates support, seamless AV Updates, easy application blocking, enable-disable-configure with no rebooting ever, super flexible, easy, secure! Clean Slate has been declared an award-winner in the security category by Media & Methods, Technology & Learning, and Curriculum Administrator magazines. For more information, go to our Awards Page. Clean Slate, developed and manufactured in the United States, is designed to protect public access computers from malicious or inexperienced users. While not restricting users’ activities, Clean Slate will scour drives back to their original state upon reboot or log off. Clean Slate takes only minutes to install and needs no attention, ever, for most installations. Clean Slate restores the computer to its original configuration discarding unwanted user changes: including erased files, installed software, downloaded spyware and adware, downloaded viruses and Trojan horses, and altered icons. Clean Slate not only clears unwanted changes, it also blocks unfamiliar executables from running. With this important benefit, Clean Slate allows computer maintenance tasks to be performed without the need to remove students from computers or disable security on computers. The effortless configuration Clean Slate offers is ideal. Clean Slate can automatically configure many applications that require special attention, easing administration. 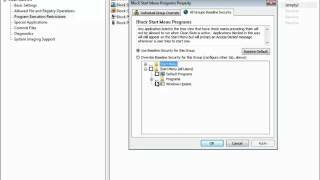 A number of applications, typically legacy antivirus types, do not treat the file system in a way that is compatible with the default configuration of Clean Slate. Clean Slate will look for these known applications and make special accommodation so the applications can function as designed while Clean Slate security is active. Nothing is required of you but to install Clean Slate. Clean Slate protects from rogue administrators. All of the security features can be applied to local system administrators and domain administrators, too. Normally, administrators have unrestricted access to a computer. Clean Slate changes this, and allows enforceable restrictions on administrators’ activities. Clean Slate security goes beyond just clearing unwanted changes. You can also block programs from running. Clean Slate reads and lists all the programs in your start menu. 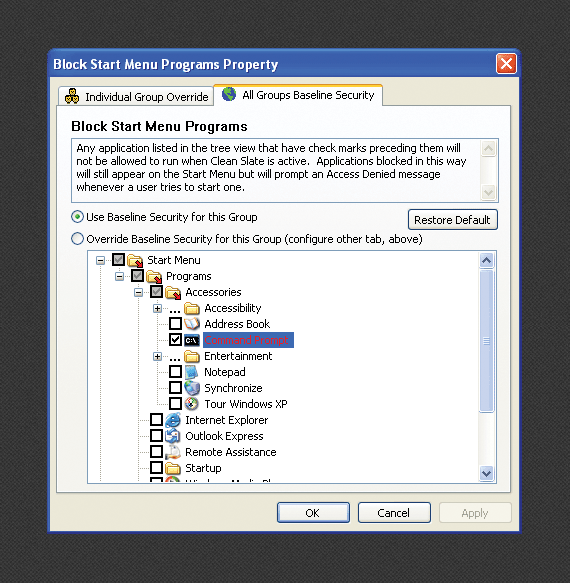 While in the Clean Slate configuration screen, simply select the programs you want blocked. Once configured, the programs can not be accessed. Not only will Clean Slate block the execution of any presently installed programs but also unknown programs from the Internet and removable media (USB drives, CD ROM, network shares, floppy disks, etc.). 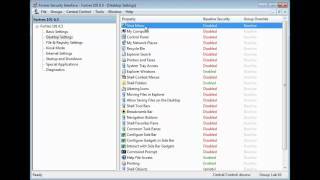 Rated best nonrestrictive desktop security software, Clean Slate is easy yet powerful. Administrators, by password, can specify individual drives or directories not to be cleared by Clean Slate, allowing persistent changes in some areas on the disk. Additionally, administrators can view all changes made and specify which changes should be undone on reboot or log off and which should be committed as permanent changes. Compatible with all major antivirus software, Clean Slate is the ideal solution. Clean Slate, while the security is active, allows antivirus updates to install properly. Clean Slate will automatically configure your antivirus software. Once configured, all antivirus updates will install, effectively protecting your computers, without fear of the update being removed at log off or reboot. Customizing any area of the computer to precisely accommodate your security need is quick and easy using wild cards and environment variables. In a computer programming environment, Clean Slate can allow students to save and test changes. Clean Slate actually prevents the original files from ever being modified. 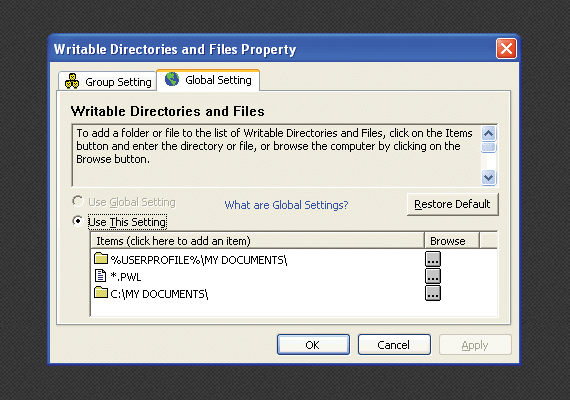 Instead, Clean Slate caches all unwanted changes in a special folder that is hidden and protected from the users. When the computer is rebooted or a user logs off, Clean Slate merely discards the cached changes. Packed with features, Clean Slate provides impressive flexibility. The powerful security of Clean Slate discards all unwanted changes; plus, it is flexible allowing permanent saves where desired. 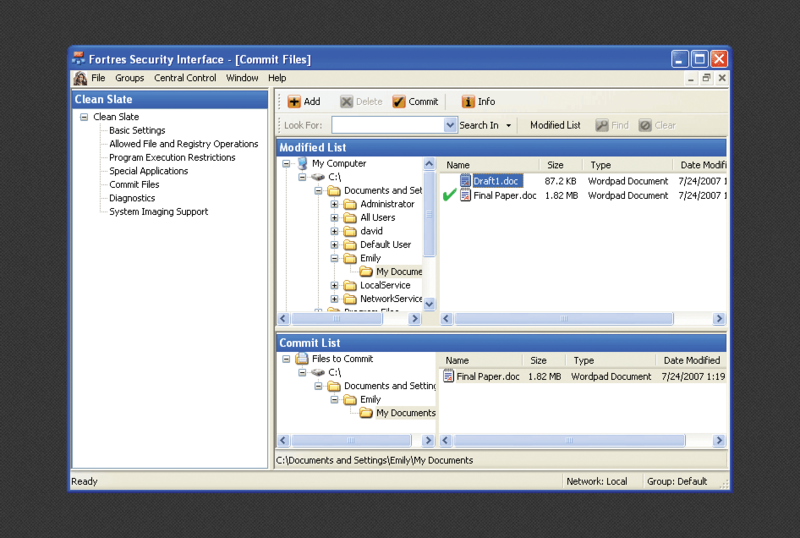 Clean Slate has the ability to allow permanent saves by Registry key, file name, or folder. Any program can easily be configured to run without Clean Slate clearing changes. This is ideal to retain antivirus updates. Central Control allows an administrator to configure all of the Clean Slate and Fortres 101 installations from one location. For more information on Central Control, click here. 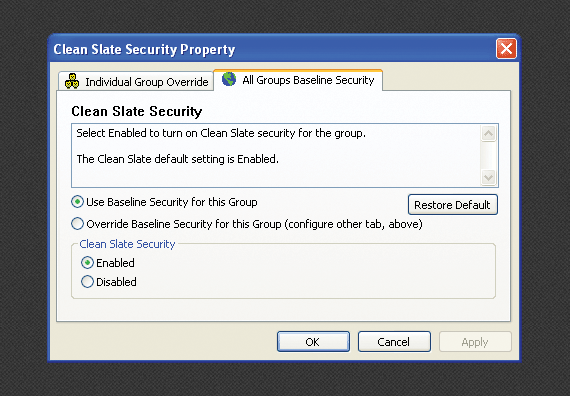 With Central Control, each computer can have a scheduled time when Clean Slate security is disabled. 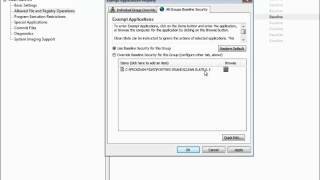 Remotely disabling security on one or multiple computers, without having to reboot, makes maintaining your computers fast and easy. 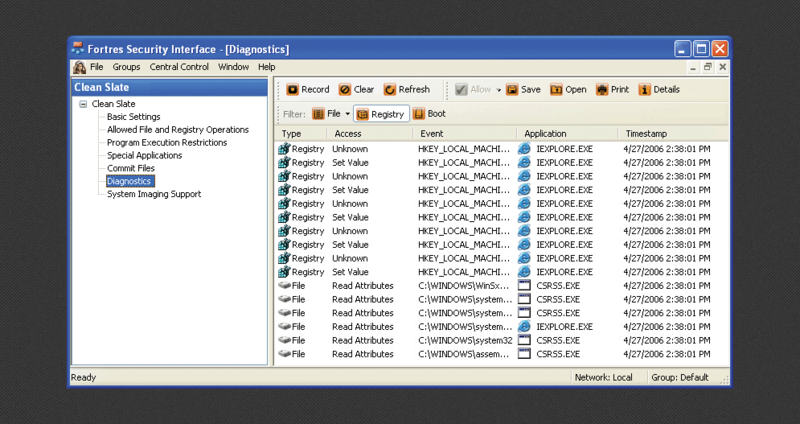 Enhance Clean Slate security with Central Control network software. Control Clean Slate security settings over a network. Remotely update/upgrade Clean Slate installations. 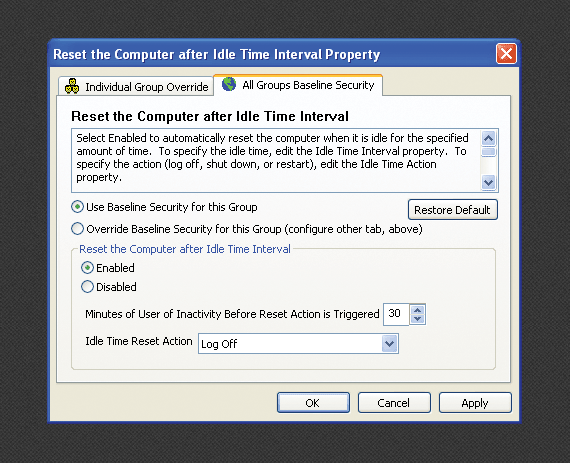 Disable computer security at scheduled times. Customize Clean Slate security based on computer, user or group. Disable Clean Slate remotely based on computer, user, or group. Restart, shut down, or log off remote computers. Builds on existing LDAP network users and groups. 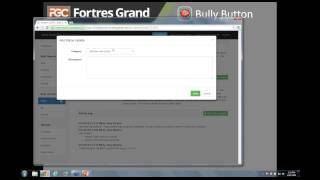 One configuration screen for two powerful security products: Fortres 101 and Clean Slate. User and group settings follow the user to any computer on the network. Centrally store and manage configuration files. 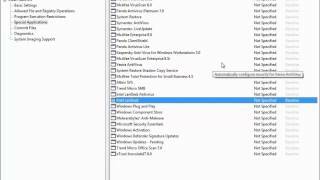 Supports 32 Bit and 64 Bit Windows 2016/2012/2008 Server. To learn more about Central Control, click here. Are you still looking for more great reasons to upgrade? Operating System: 32 Bit and 64 Bit Windows 10, Windows 8.1, Windows 8, Windows 7. Clean Slate has saved me man-years of time. Our desktops look exactly like they did the day I installed Clean Slate (over 7 months ago). And I know that the computer is safe as only a microscopic portion of the hard-drive is exempt from change to allow certain applications to function properly.